Rothco Lightweight Concealed Carry Jacket with 2 inner pockets for concealed carry one on each side as well as 2 inner mag pockets on each side for ammo. The mirroring pockets on both the left and right, give the jacket a unique ambidextrous feature. 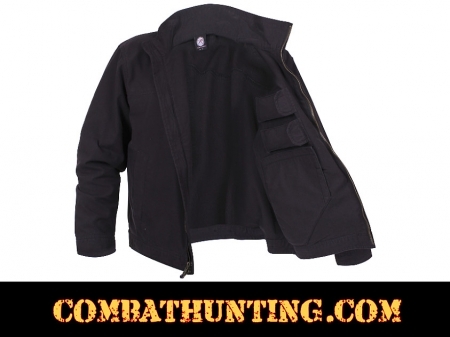 This tactical jacket is made from a lightweight cotton/polyester blend and features 2 zippered front pockets & adjustable button wrist closures. Color Black.